Taking these historic pieces as inspiration not only in terms of design but also technique, Lalaounis explored ideas of symbolism, artistic expression and craftsmanship, and his early designs are very much a reflection of this. He spent years seeking ways to revive age-old techniques such as granulation, filigree, hand-weaving, and hand-hammering and, along with his team of passionate and skilled craftsmen, finally produced his first two collections of jewelry in 1957. The collections were called ‘Minoan and Mycenaean’ and ‘Classical and Hellenistic’ and were largely recreations of ancient pieces but made with the modern woman in mind combining both traditional techniques and modern technology to produce wearable, desirable jewels. The result of exhaustive research, the pieces successfully married the ancient craft of goldsmithing with a contemporary sensibility and were exhibited at the Thessaloniki International Fair that same year. 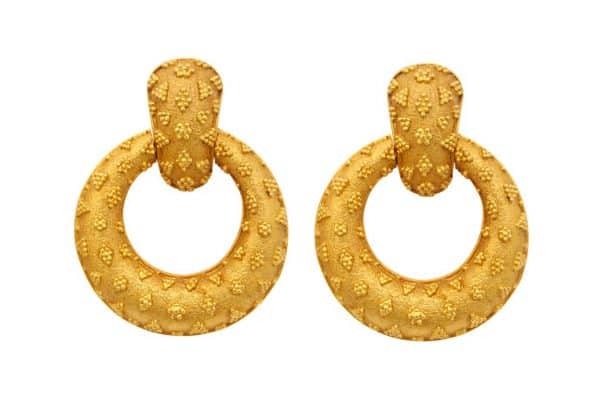 Lalaounis found these periods of ancient history rich with ideas including subject matter, shapes and themes, indeed they were “so full of human interest and so timeless” that they immediately connected with people and the jewelry was warmly received. Many pieces were crafted in 22ct gold which was favored for its rich, warm color and malleable nature but 18ct was also used and whilst most pieces were unadorned with gems, some utilized stones such as rock crystal and rubies for added interest and patterns. When his uncle died, Lalaounis decided the time had come to branch out on his own and in 1969 he founded his eponymous company with headquarters overlooked by the Acropolis, the embodiment of Ancient Greece and all that fuelled his imagination and creativity. New collections were produced every six months and during the 1970’s his research broadened and he found inspiration in astronomy, medicine, nature, and modern technology but regardless of what sparked a new design, the jewels always had a recognizable ‘Lalaounis’ touch. His success and reputation grew quickly and further stores were opened first on surrounding Greek islands and then in due course throughout Europe including Paris and Geneva before eventually taking his unique brand of ‘new old’ jewels to cities such as New York and Tokyo. As well as designing his own jewelry, Lalaounis was a great supporter of the Greek jewelry trade in general and set up both the Greek Jeweller’s Association and the Goldsmith’s Union. He sought to promote the craftsmen and jewelry of his homeland at every opportunity and was widely recognized as having been instrumental in the resurgence of interest in traditional Greek jewelry both at home and abroad. In 1990 he was honored by the Institute de France, Academie des Beaux Arts et des Lettres for his exceptional contribution to the art of jewelry creation, becoming the first goldsmith to be recognized in this way. In 1993 the company moved its workshops into new purpose-built facilitates and redesigned the existing building to house ‘The Ilias Lalaounis Jewelry Museum’. 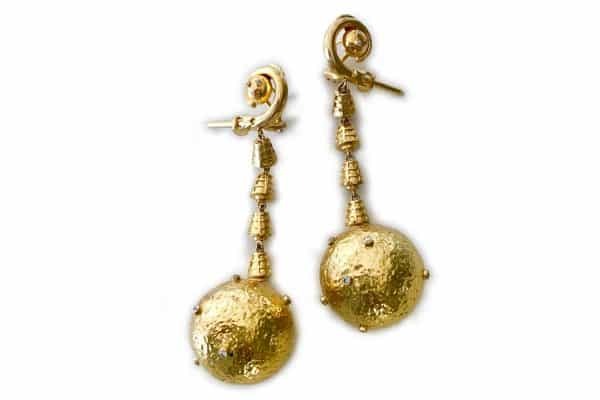 Their permanent collection includes over 4000 pieces of jewelry and micro-sculptures from the many collections designed by Lalaounis during his wonderfully fruitful career. In 1998 he passed control of the business to his four daughters and in 2013 he passed away, leaving behind a huge body of work which is beloved and collected by women the world over.